ESA/Rosetta/NAVCAMOn Nov. 12, Rosetta will dispatch Philae to land on comet 67P/Churyumox-Gerasimenko depicted here. Wednesday, Nov. 12 will either be history-making or heart-breaking. That day will be the culmination of a ten-year project that has already taught us much about our solar system. On Nov. 12, Rosetta will deploy that cargo — the Philae lander — on humanity’s mission to make physical contact with a comet for the first time ever. The lander is scheduled to touch down on the comet at 10:35 am EST (7:35 am PST) on Wednesday, Nov. 12. While we won’t actually be able to see Philae land from Earth, we can experience this incredible moment through live broadcasts provided by ESA, NASA, and Slooh. It will take Philae 7 hours to descend to the comet’s surface — one of the most difficult maneuvers we’ve ever tried in space. For the scientists at the ESA and NASA — it will be 7 hours of terror. 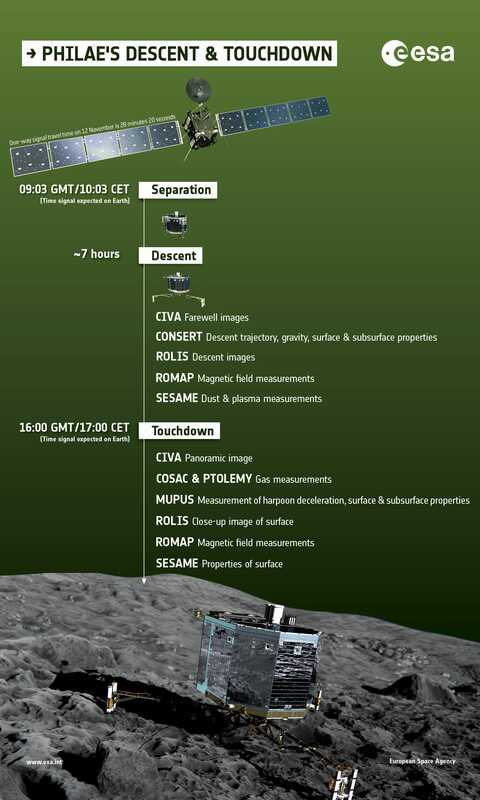 Here’s a handy infographic showing the steps of Philae’s 7-hour descent, starting at 9:03 GMT (4:03 am EST) until the end, when Philae lands, at around 16:00 GMT (11:00 am EST). These events will actually take place about 27 minutes before we hear about them on Earth because comet 67P/Churyumox-Gerasimenko is roughly 300 million miles from us (also, wow). ESA, NASA, and Slooh will offer broadcasts at different points during the event. First up is ESA, which will begin a live broadcast tomorrow, Nov. 11 at 9:00 pm EST (7:00 PST). At this time, ESA will decide whether the mission is a “go” or a “no go.” If it’s a “go,” that means the ESOC mission control will manoeuvre Rosetta into position to drop Philae. For the next 24 hours, ESA will live stream (shown below) the ESOC Mission Control Room as it readies Philae for the drop. For a complete timeline of the events, visit ESA blog. In addition to ESA, NASA will also broadcast the event. NASA’s live stream, provided below, will begin Nov. 12 at 9:00 am EST and last until 11:30 am EST. It will include excerpts from ESA’s broadcast and will include the crucial time, around 11:02 am EST, when we will know if Philae landed safely. After Philae is scheduled to touch down, the live online observatory, Slooh, will host a special, one-hour broadcast starting Nov. 12 at 2:00 pm EST. The broadcast (embedded below) will include commentary from Slooh and ESA scientists as well as imagery of the comet from an observatory at the Institute of Astrophysics in the Canary Islands. 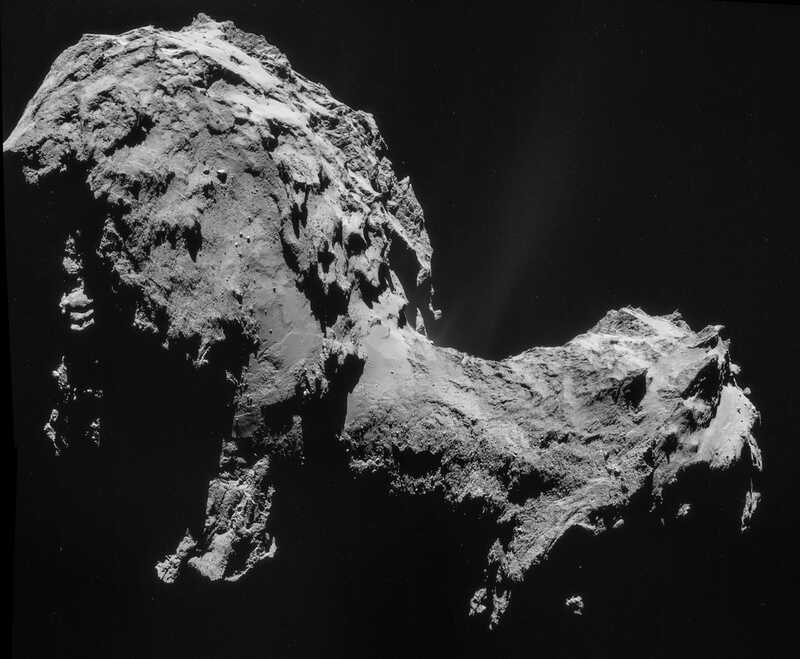 As Philae descends, it will take images of the comet and will continue snapping images after it lands. Philae will have enough battery power, scientists suspect, to obtain data for about two-and-a-half days after landing. During that time it will collect data from the surface to study the comet’s composition. According to the latest update from scientists involved with the Rosetta mission, both Rosetta and Philae are in “great shape” for Wednesday.